White Oak also known as eastern white oak, stave oak, fork leaf oak and ridge white oak has a broad, round, dense head, spreading branches and purple-red fall colors. White oak is a medium to large tree from 60-100'. Trunks from 3-8' in diameter. The most widespread of the white oaks. The white oak leaf is dark green in summer and hang on thru the winter as most Oaks do. The leaves are 4 to 10" x 2-4"with 5-9 moderate to deep rounded lobes. They are alternate on the stem, dark green with whitish or greenish hairs. Interesting flaky bark. I consider the White Oak one of the more beautiful of Oaks. The nut of the White Oak tree is about 1" long covered 1/3 by the cap, ripens the 1st year. The white oak group of trees (50 types) all have acorns that mature the first autumn, heavy crops happen every 4-7 years. The acorns are sweet, edible and a favorite of wild game. White Oaks can be transplanted Balled and burlapped when small. We grow some of our big white oaks in growbags which allows us to hand dig trees up to 3" caliper. White Oaks have a tap root that grows beneath the trunk in soil that drains well, but this is not present on most trees planted on clay or compacted soil. By using our root bags to control root growth should help growers of nursery plants make more of these native trees available. 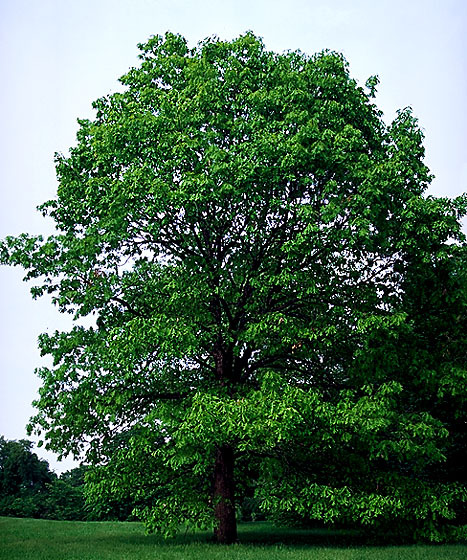 White Oak grows best in moist soil that does not dry out for long periods. Trees are usually well structured and require little pruning after 20 years except to remove dead wood. Early pruning should concentrate on maintaining a central trunk. Branches should be spaced about 18 to 24 inches apart. 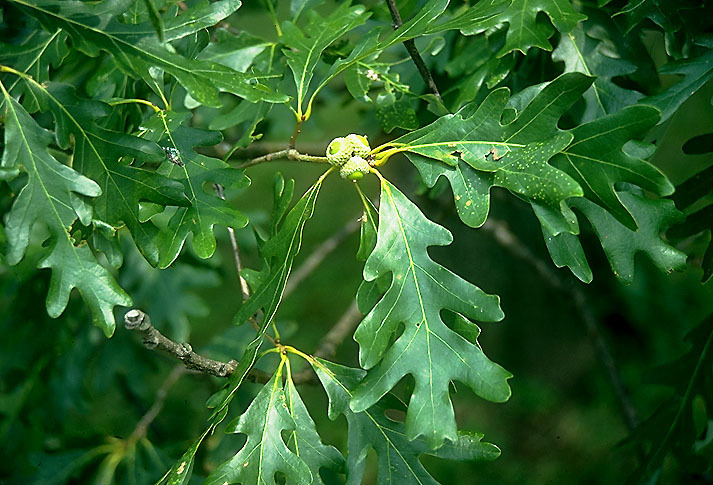 White Oak grows in sun or partial shade and prefers an acid, moist, well-drained soil. These trees are long lived but somewhat slow growing. It is best to start out with a large seedling or sapling to save some growing years. The white oak lumber is hard, heavy, durable, tough with a light brown heartwood, contrast to red oak with a darker reddish-brown wood. The wood was used in sailing ships of old. These days the wood is used in furniture making, flooring and barrel making which is why it is also called stave oak. Vernor's ginger ale is aged in white oak barrels. The wood is also used for railroad ties and fuel wood. 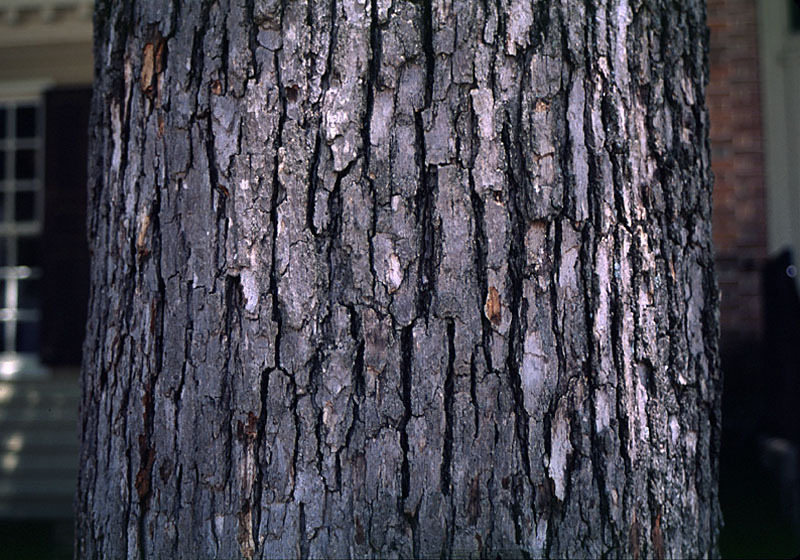 The bark is used for tanning leather. The gypsy moth is one of the more destructive pests of the oaks. The caterpillars hatch in late April to May and take about 7 weeks to develop. Gypsy moth overwinter in egg masses laid on trees. Chemical treatment is effective on caterpillars though not necessary unless there is 30% or more defoliation. Cottony maple scale can effect oaks. Look for white egg sacks on branches. Insecticides are rarely needed. Two lined chestnut borer lays eggs on the oaks and the larvae burrow under the bark emerging in a D shaped hole. Stressed trees are more prone to attack. Treatment is not practical once they are burrowed under the bark. Oak wilt is probably the most serious disease of the white oak although they are less susceptible than the black oak family. It is spread by the picnic beetle which carries the spores tree to tree. Prune your oaks only when dormant. White Oak tree can grow to 100' in the woods. The White is hardy from zone 3 to zone 9. Slow to medium growth rate. White Oak Trees are North American native to the following North American places: pretty much the whole eastern half of the USA with the exception of South Florida and Northern New England. White oak is rare in the upper peninsula but common in the lower peninsula of Michigan. We also have: Burr English Oak, English Oak, Willow Oak, Chestnut Oak, Columnar English Oak, Shumard Oak. White Oak, Swamp White Oak, Pin Oak, Northern Red Oak, Heritage Oak, Regal Prince Oak, Rocky Mountain White Oak, Oregon White Oak, Burr gambel Oak, Scarlet Oak, Northern Pin Oak, Bur Oak, Chinkapin Oak seedlings. White oak seedling and transplants prices are below. White oak in Michigan are found mainly in the lower peninsula especially in the southern half but occasionally in the Upper. Quercus garryana Oregon white oak from southern BC to California. To buy large B+B oaks call. To order White Oak seedlings by PHONE: We're glad to take your order by phone. For your convenience, we have a toll free number 800 568-9179. Phone orders can be charged to VISA, American Express or MasterCard accounts. Are you looking for the finest organic coffee?